Home | Practice Areas | Personal Injury | Do I Have to Sue? Over the years, there has been a lot of “fake news” generated by insurance companies about people who file lawsuits. Propaganda published by insurance company executives and industry organizations would have you believe that frivolous lawsuits and outrageous litigations are “totally out of control.” In fact, civil lawsuits have declined dramatically since 1993. But the insurance companies like to cherry pick the one or two bad examples and use them to try to dissuade totally legitimate claims from ever being filed. One reason for the decline in these civil lawsuits has been that insurance companies have spent millions of advertising dollars annually trying to convince the public that lawsuits are ruining America. They have tried to create a “negative force field” around the idea of filing a civil lawsuit even when you have very good reason to do so. The truth is that insurance companies will do anything to avoid paying what people are legitimately owed, and in some cases are even refusing to pay agreed-upon settlements. Another result of this negative advertising campaign is that more and more people are asking themselves, “Do I have to sue?” The bottom line is simple. If you have been injured in a car accident or a workplace incident, at a mall or even at a neighbor’s home, don’t feel “guilty” because you think you should receive legitimate compensation. You have a right to seek relief in the courts if your request for rightful compensation has been wrongly denied by an insurance company. What Factors Should I Consider Before Filing a Lawsuit? Do I Have to Sue to Get an Award? Your property suffered significant damage because of a weather incident, or in the case of a fire, potential negligence. You have suffered a significant personal injury as a result of a car accident or an incident at a place like a mall or somebody else’s home and you are worried about how to pay your medical bills and deal with lost wages. Perhaps the way you were treated has led you to feel that you need to right a wrong. Or perhaps the way you were treated makes you want the other party to pay. 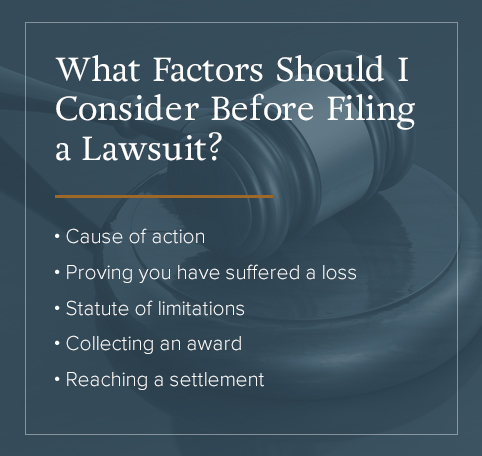 Whatever your personal reason for filing a lawsuit, there are several important factors you need to consider before you do so. Do I have legitimate legal claim? Am I ready to accept a compromise settlement or go into mediation? If I do file a lawsuit, can I collect my award if I win? If you answer any of these questions in the negative, a lawsuit may not be your best option. If, however, the answers to all the questions are yes, it is then important to determine whether or not you have a good case. Normally this means you can prove that the person or company against whom you wish to file the lawsuit was negligent in some way. You must also be able to prove that the result of this negligence was an injury that caused you and your family damage. Personal injury law says it is up to the person making the claim to prove any claims of negligence. You will need to be able to prove to a judge or jury that your injury was caused by the negligence of the person or company are suing. This is another good reason to have a good personal injury lawyer in your corner. Standards of proof are often very high and personal injury lawyers understand what the courts are looking for and can help you prepare the evidence you need. Also remember that if you suffer an injury on the job, you will need to file a workers’ compensation claim. In almost every case, workers cannot sue their employers if they are injured on the job. Cause of action: Courts work in specific ways and if you want to file a lawsuit, your case needs to conform to a legally recognized cause of action. For instance, say you are walking in a mall and the floor has just been washed but no signs have been put out to tell you to be careful. If you slip and fall and injure yourself, the owners of the mall have been negligent. By failing to let you know that the slippery floor is dangerous, it is a possible “breach of contract” — you have a right to expect that you will not be hurt when you visit their shopping mall. A personal injury lawyer can help you determine the cause of action needed for your lawsuit. Proving you have suffered a loss: Can you prove that you were injured by the mall’s negligence and that you have suffered a loss as a result? If you can, then you should proceed with your lawsuit. Statute of limitations: In many places is important to file your claim within a specific period of time after you have been injured. This does not mean you need to do so immediately, because most people need some time to determine the extent of their injuries. But most states do work within a very specific time frame, normally around two years. If you wait too long, you will not be able to file a claim. Personal injury lawyers are well aware of the statute of limitations in every kind of personal injury case. Collecting an award: Sometimes the person that you wish to file a lawsuit against is in a bad financial situation. It may be to your advantage to wait to file a lawsuit until their situation improves, always keeping in mind the statute of limitations. Sometimes a little patience is the best answer, but once again a personal injury lawyer can advise you on what to do in the situation. Reaching a settlement: Remember you can file a lawsuit without going to court. Only use a lawsuit and the courts if you are unable to come to an agreement with the other party or if you feel the insurance company is not treating you fairly. Often the threat of filing a lawsuit will help bring about a settlement. It really depends upon the situation in which you find yourself. If you have suffered a personal injury and you know that you can meet the standards that we mentioned above to prove the other party’s negligence, and the other party is eager to reach a fair settlement, then you may not have to sue in order to get fair compensation. But having this happen is extremely rare and almost never happens. Even when the other party wants to settle the matter quickly and fairly, that does not mean their insurance company wants to go along for the ride. Remember insurance company lawyers spend their entire careers thinking of ways they can avoid paying fair compensation to people who have been legitimately injured. It is possible in many situations to reach an out-of-court settlement. The key question for you to decide is if you are getting the right amount of compensation to which you are entitled. Insurance companies are often happy to talk with you about out-of-court settlements because most of the time they will use them to try to convince you to accept less. Insurance companies can also use out-of-court settlements as ways to eliminate their need to pay any additional compensation that you may be entitled to receive. If you want to successfully sue another person or company, you need to have everything in order. You need a solid strategy on how to confront insurance company lawyers, your evidence needs to be organized and properly prepared, and you need the help of someone experienced in fighting these legal battles. What If I Don’t Want to go to Count? Hiring a personal injury lawyer does not mean that you are hiring a lawyer to file a lawsuit unless you both decide that is absolutely necessary. But working with a personal injury lawyer means that if you decide to accept an out-of-court settlement, you are not going to get tricked by the insurance company. Here are some things to know about working with a lawyer. Be sure you choose a good personal injury lawyer in any case where you have suffered a significant injury or other key losses. Generally, if you are out of work for more than a few days, or if you break a bone or suffer some other significant injury which results in medical bills in the thousands of dollars, you need to hire a good lawyer even if you do not want to go to court. The vast majority of smaller personal injury claims never see the inside of a courtroom or involve a lawsuit. A good lawyer knows this and will work with the other party’s lawyer or insurance company to make sure you receive fair compensation. But if your claim involves a permanent injury or impairment, your lawyer will file a lawsuit. A good lawyer will not file a lawsuit until the person they are representing reaches maximum medical improvement. This point is reached when all medical treatment is finished, and the client is recovered as much as possible. The lawyer does not file the lawsuit until this point because they will not know how much to ask for in damages until then. Although if you do decide to file a personal injury claim you must meet your state’s statute of limitations, that does not mean that your case needs to go to trial within that time. Once a lawsuit has been filed it can often take a year or two to go to trial because of the various steps that need to be taken, like discovery. So even if you file a lawsuit, there is still plenty of time for your lawyer and the insurance company’s lawyers to reach a settlement that will provide you with a fair compensation. Please remember, you are the victim in this situation whatever the circumstances that led to your injury. It was not your fault that someone else hurt you. Insurance companies are obligated to compensate you if you have suffered significant or permanent injuries but they will do their very best to make sure you are paid as little as possible. That is why you hire a personal injury lawyer. Imagine trying to negotiate a settlement when you have just been injured or are recovering from serious injury. The lawyer for the liable party knows this is not the best situation for you and will absolutely try to take advantage. That is why having a personal injury lawyer as your advocate not only means the insurance company lawyers will not be able to cheat you but also that you will be able to deal with your physical situation while pursuing a legitimate claim at the same time. When you try to decide whether or not to file a civil lawsuit, the entire process can seem frustrating and confusing. You want to make sure you are making the right decision. Our team of experienced and knowledgeable lawyers wants to make sure you receive the maximum amount of compensation to which you are entitled. At KBG Injury Law, you are not just another client but a person who needs our help. Our goal is to give each client the individual attention and consideration they deserve. We understand how a wrongly denied insurance claim can affect you emotionally and financially and how important it is for you and your family to be able to resolve all issues as quickly as possible. We invite you to take a free consultation where we can talk about your situation and determine if there are ways that we can help you. You can reach us 24 hours a day at our toll-free line 1-800-509-1011. Or you can request a free consultation and one of our talented team of lawyers will get back to you as soon as possible.